Is there a word for a person who can't do things right? Or can't handle things, and ends up messing up? It was nicely coming along. Now, however, it is deleted. I asked why this happened and received the stock answer it was deleted because of being off-topic. I'm questioning this order of events. Why remove something generating quite lively and interesting input so late, after much happening, and why remove, not just put on hold? What are the decision points here? I'm... disappointed as this stands. EDIT after the answers received. Good answers both. But still disappointed. Taking this further here. This question did not meet the criteria for single word requests, and the original poster never edited it or returned to it in the approximately five days since it was closed (closed Aug 18 at 13:59, deleted Aug 24 at 1:58). Is there a word for a person who can't do things right? Or can't handle things, and ends up messing up? I wanted to learn more about words that might describe me, or something related to my question. There was no sample sentence. In my opinion, a sample sentence isn't actually necessary if the question is clear enough otherwise, but this question was definitely not clear. Use this tag for questions that are about finding a single word to fit a meaning. Describe the intended meaning, its connotation—is it laudatory or derogative, and/or context in as much detail as you can. There was some description of the desired meaning. It's likely the desired connotation was negative, but it's not entirely clear, since the original poster wants to describe himself using the word. There was not much detail and pretty much no context. Questions that show no research are likely to be closed. Does the question list which words you didn't like? The answer to all of these is "no." In general, if a question is bad enough to be close-worthy, it's bad enough to be deleted. 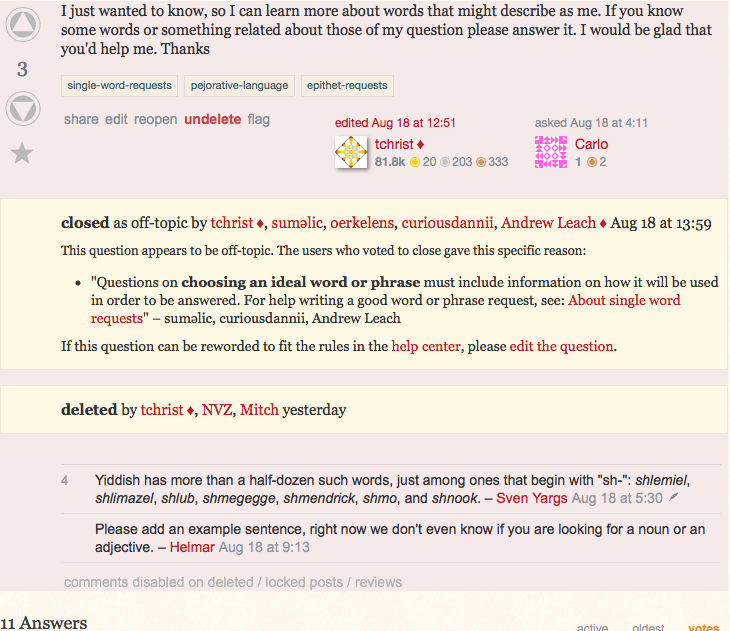 Supposedly, this site's mission is to be a "library of detailed answers to every question about English language and usage." Single word requests, with their tendency towards single-word answers, have always been an uneasy fit with this goal, even though they constitute one of the largest categories of questions on this site. Jeff Atwood's answer to the preceding question specifically mentions that good questions make it easier to write good (=long, detailed) answers. The requirement for citations in answers and the character limit does provide a kind of "lower bar" for answers to any single word request, but its difficult to get much detail beyond that without more detail in the question. For this question, the top three answers were essentially just words and quoted dictionary definitions. Whether a question is suitable for the site is decided at the time it is put on hold, i.e. when voting to close a question. Those votes don't immediately lead to deletion. Questions are put on hold so that the OP can address specific deficiencies. If the issues are adequately addressed, the questions can, and should, be reopened promptly - with a nudge at Meta if required. The primary 'decision point' for deleting a closed question is then whether the stated reason for its closure has been adequately addressed. If it hasn't, the onus is on those who want to keep it open to explain why the reason for closure was invalid. In this case, the revision trail suggests that the OP has ignored the request in the notice to edit the question, as well as the request in comments for more information. As such, the decision to delete simply ratifies the decision to close the question. Note that at Stack Exchange, all questions and answers are freely editable by anyone with at least 2000 rep and, subject to review, freely editable by those with less rep. It doesn't matter who edited the question - if the reasons for closure are adequately addressed by the edits, anyone may note this on Meta and request that the question be reopened. Not the answer you're looking for? Browse other questions tagged discussion on-topic-off-topic closed-questions deleted-questions deleting-posts .